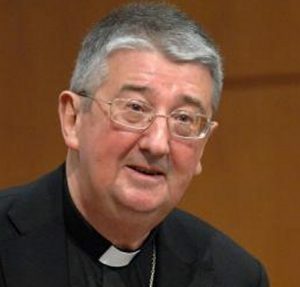 The Archbishop of Dublin has praised single parents who in the past challenged a “narrow moralistic culture” which ostracised and humiliated single parents. “It was women who stood up and challenged that culture and affirmed their desire and right to be able to keep and give love to their children,” he said in a statement released yesterday. The Church must always be pro life, said Archbishop Diarmuid Martin – a “beacon of support for life” at its most “vulnerable moments” and a beacon of support at vulnerable moments of any woman or man along their path of life. However, repealing the Eighth Amendment is not about permitting limited abortion, he said, pointing out how the legislation allows abortion without restriction up to twelve weeks, and on physical and mental grounds up to six months. Describing the repeal of the Eighth Amendment – where the rights of the unborn are left “definitively” without constitutional protection – as a “point of no return”, the archbishop called on the Catholic community in the Archdiocese of Dublin to join moments of prayer in parishes in the coming days. The most recent poll on the referendum, published yesterday in the Irish Times, shows the Yes side (for Repeal) ahead by 12 points at 44 per cent and No at 32 per cent. Undecided voters are at 17 per cent. The Yes side has dropped ten points since the end of April and the No side is up four points. Dublin remains the part of Ireland most in favour of repeal. When the Don’t Knows are excluded, 68 per cent favour repeal.